The people have spoken and selected their winner! On Sunday afternoon it was time for the Crowd's Favourite, voted by the general public. A great fun for the fans, by the fans, who chose Magnums Volcan K.A. at the Elran Cup, held in Castle Alden Biesen in Bilzen, Belgium. The chestnut QR Marc son, bred and owned by Knocke Arabians, Belgium, trotted swinging and light on his four white-socked feet to accept the award, well handled by Glenn Schoukens. Magnums Volcan K.A. is out of the Magnum Psyche daughter FS Magnums Madonna, combining the world famous sires Marwan Al Shaqab, Ruminaja Ali, Padron and Bask. Prior to that success, Magnums Volcan K.A. achieved Gold Champion Junior Colts with H Pacino by Vivegas, bred by Rosehill Farm, UK, and owned by Maz Arabians, Belgium winning Silver and another QR Marc son, R'adjah de Cartherey, bred and owned by Rigat Chantal de Cartherey, France, winning Bronze. Well, it's time to take a deep dive into the list of champions. DA Alihandra becomes a highly decorated junior filly this season, a filly, which one must be aware of. 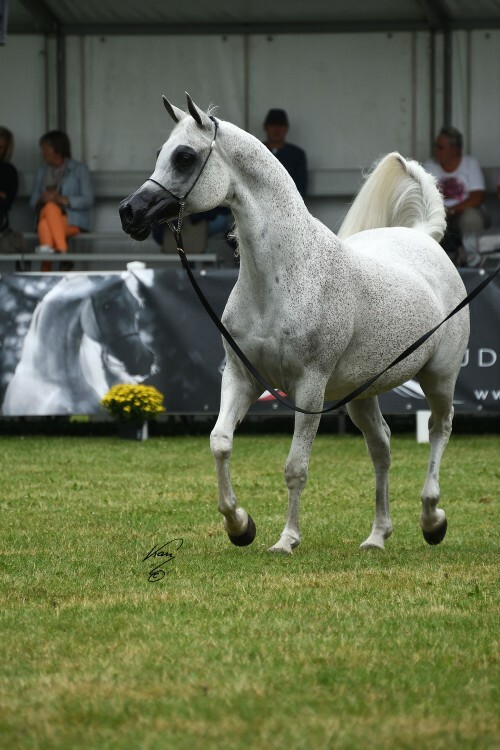 The Elran Cup was the fourth competition for DA Alihandra and she came home with gold – again. The grey EKS Alihandro daughter out of DA Miss Justice, tracing back to Rodania, was the unanimous choice of the judges for Gold Champion Junior Filly, shown by Frank Spönle. The proud breeder and owner is Cornelia Kolnbeger, Austria. Silver went to Christine Jamars Emerald J daughter Marrakech J, who also became Best Belgian Participant. 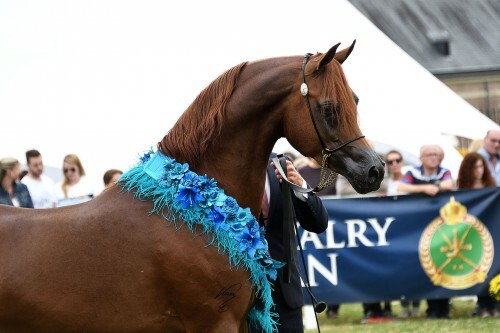 Bronze went to Safiat Al Shaqab, by Kahil Al Shaqab, bred and owned by Al Shaqab Stud, Qatar. The Gold Champion Yearling Filly was unanimous, too, again handled by Frank Spönle. The winning filly Arsenia OS is by chestnut AJ Mardan but inherited her bay coat from her lovely dam, Maryse OS by Marajj and traces back to the precious Mammona. The suffix "OS" show Arsenia is bred by Osterhof Stud, Germany, and the proud owner is Ajman Stud, UAE. The Wadee Al Shaqab daughter Ashwaq Al Shaqab, bred and owned by Al Shaqab Stud, received Silver and TM Galileah by Shanghai EA, bred by J.O. A Teixeira Junior and owned by Mr. Mubarak and Adel Al Khashab, of the Al Khasab stud Kuwait, won Bronze. Christine Jamar was delighted to receive Gold for her chestnut yearling colt Muntasir J. Frederik Van Sas presented this chestnut Excalibur EA son to the judges. His dam Mississippi J is by QR; so again the successful combination of WH Justice and Marwan Al Shaqab. The Silver winning Picasso Di Mar, by Cavalli, was named after the famous Spanish painter and sculptor, but is bred and owned by Soc. Agr. Tre Stelle, Italy. Athbah Stud won Bronze with the EKS Alihandro yearling Hatem Athbah with Nicolas Frere on the lead. Frederik Van Sas also showed little Diva La Luna, a stunning ES Harir daughter out of Safeera El Marc to Gold Champion Foal for proud breeders and owners Jack and Nicole Vaesen. The Senior Mare Championship was definitely another highlight of the show. The noble Pepita is gifted with a powerful, energetic trot. The grey Ekstern daughter, bred by Janow Podlaski and owned by Fali Stud, is no newcomer to the show ring. Pepita was Polish National Senior Champion Mare and topped the 2015 Pride of Poland Sale, fetching 1.4 Million Euro. At the Elran Cup, Pepita received the highest score of the show and was awarded Unanimous Gold Champion Senior Mare. 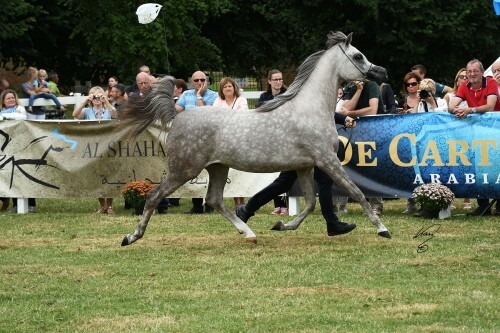 Al Shaqab Stud won Silver with another Kahil Al Shaqab daughter, the bay Al Anood Al Shaqab, while Straight Egyptian bred Elisa, by Baha AA went away with Bronze. Elisa is bred by Yeik Edri, Israel, the proud owner is Hanaya Arabians, Switzerland. The Senior Stallion Championship saw a unanimous choice, too. And again a champion was named after a globally famed painter: Van Gogh AM, shown by Frank Spönle. The dark bay stallion is by Magnum Psyche out of Ynazia HCF, who combines the blood of Aladdinn with Bask. Sally Badeker, USA, is the breeder and Asayel Stud, Kuwait, the proud owner. Sabea Al Sahraa by Koronec, owned by Athbah Stud, KSA, won Silver and Bronze was achieved by Munir Al Adeyat by WH Justice, bred and owned by the Royal Cavalry Of Oman. It was a wonderful 18th Elran Cup organized by Kristel van den Broek and Josy Everars and their team under the patronage of Al Thumama Stud, Qatar. We all know, how much work and what kind of a challenge it is to organize such an event! 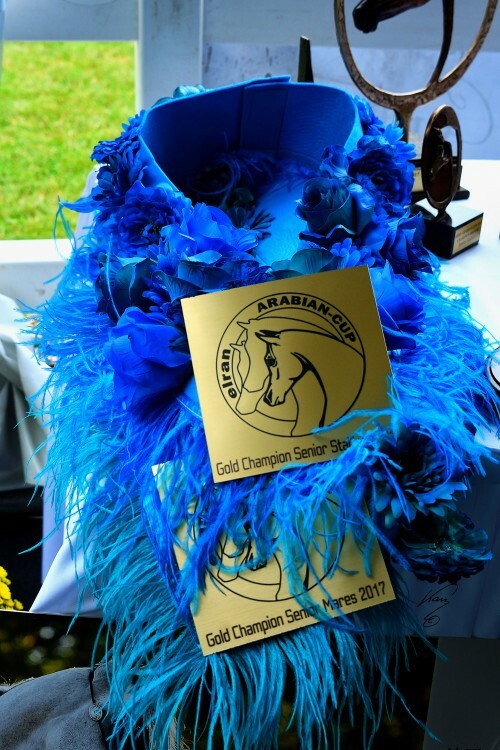 Heartfelt thanks go to the breeders, owners, trainers, handlers, and fans of Arabian horses and to all the generous sponsors.